This collection contains the Affordable Learning Solution for the Southern University System (AL$4SUS) list of peer-reviewed textbooks for Principles of Macroeconomics (common course-id ECON 202), one of the top 50 college courses identified for inclusion in the Southern University Online Library for Education (SUOLforEd). An introductory course focusing on aggregate economic analysis. Topics include: market systems, aggregate measures of economic activity, macroeconomic equilibrium, money and financial institutions, monetary and fiscal policy, international economics, and economic growth. Identify and interpret macroeconomic data. Apply macroeconomic models to understand the economy. Analyze the economic impacts of monetary and fiscal policy. Demonstrate an understanding of the function of the central bank and the banking system. 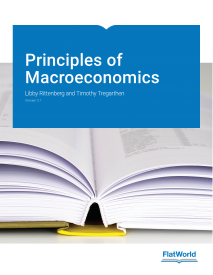 Macroeconomic: Theory, Models and Policy is focused on the material that students need to cover in a first introductory course. It is slightly more compact than the majority of introductory macroeconomics books in the Canadian marketplace. Decades of teaching experience and textbook writing has led the authors to avoid the encyclopedic approach that characterizes the recent trends in textbooks. Consistent with this approach, there are no appendices or ‘afterthought’ chapters. If important material is challenging then it is still included in the main body of the text; it is not relegated elsewhere for a limited audience; the text makes choices on what issues and topics are important in an introductory course. This philosophy has resulted in a Macro book of just 15 chapters, with three introductory chapters and the International Trade chapter, common to both Micro and Macro. Examples are domestic and international in their subject matter and are of the modern era – financial markets, monetary and fiscal policies aimed at inflation and debt control, globalization and the importance of trade flows in economic structure and concerns about slow growth and the risk of deflation are included. The integrating theme for macroeconomics is the model of aggregate demand and aggregate supply. Following its presentation in an early macroeconomics chapter, this model allows us to look at both short-run and long-run concepts and to address a variety of policy issues and debates. Recognizing that a course in economics may seem daunting to some students, we have tried to make the writing clear and engaging. Clarity comes in part from the intuitive presentation style, but we have also integrated a number of pedagogical features that we believe make learning economic concepts and principles easier and more fun. These features are very student-focused. The chapters themselves are written using a “modular” format. In particular, chapters generally consist of three main content sections that break down a particular topic into manageable parts. Each content section contains not only an exposition of the material at hand but also learning objectives, summaries, examples, and problems. Each chapter is introduced with a story to motivate the material and each chapter ends with a wrap-up and additional problems. Our goal is to encourage active learning by including many examples and many problems of different types.